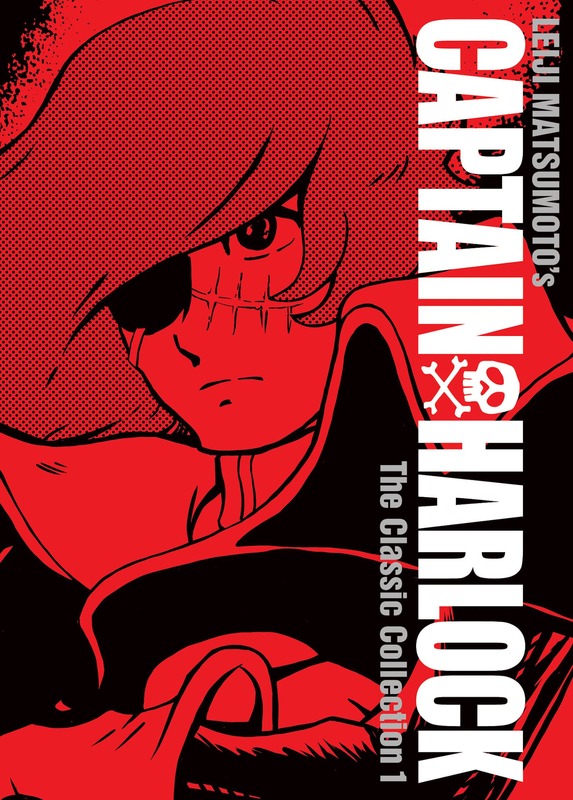 Captain Harlock: The Classic Collection Vol. 1 Review – AiPT! The sci-fi classic receives an English translation at last. In the world of science-fiction manga, few series are more well-known than Space Pirate Captain Harlock. Originally published from 1977-79, the series is written and illustrated by Leiji Matsumoto. Despite its notoriety, the manga never received an official English translation. That has finally changed, however, with the release of Captain Harlock: The Classic Collection Vol. 1. This hardback edition of the sci-fi classic is published by Seven Seas Entertainment and collects the series’s first sixteen chapters. How does Space Pirate Captain Harlock hold up forty years after its release? Is this volume good? The premise of the series–a space pirate leads a motley crew in battle against mysterious aliens–is fairly genre-typical. What’s less typical, however, is the sheer enthusiasm and level of commitment Matsumoto brings to the story and its themes. Harlock and his crew all espouse the importance of personal freedom, and their spaceship Arcadia is a sanctuary where everyone is free to do whatever they wish as long as they help each other when it counts. The characters go on many idealistic monologues about their personal philosophies, and their sincerity is quite touching. There are also passages of text that repeat at the beginning and end of most chapters, and their dramatic diction is fantastic. Sometimes purple prose is a good thing, and it certainly fits the imaginative sci-fi/adventure world of Space Pirate Captain Harlock. The manga’s two most central characters are both quite likable. Harlock himself is just plain cool. Wavy hair, a flowing cape, and an all-black outfit with a skull insignia? That’s just textbook badass protagonist. The other lead, Tadashi Daiba, is a good point-of-view character as he joins Harlock’s crew toward the beginning of the story. He is young and unsure of what he wants to do, but he eagerly boards the Arcadia’s crew and comes to love its occupants’ freedom-focused way of life. Unfortunately, the supporting cast is less consistently cool. Harlock’s first mate, Yattaran, is perhaps the manga’s worst character. He’s selfish and fairly dim-witted, and his antics are meant to provide comedic relief but the humor seldom actually lands. Another crew member, Mimay, is more intriguing thanks to her backstory and extreme devotion to the Arcadia’s cause. With that said, it’s disappointing that she doesn’t get more page-time devoted to her motivations outside of helping Harlock. Any sci-fi adventure owes a lot of its success or failure to the quality of its aliens, and this series’s extraterrestrial invaders are quite neat. The Mazon, frequently referred to as “the women who burn like paper,” are a race of humanoid aliens whose physiology more closely resembles that of plants than people. A lot of sci-fi aliens closely resemble humans or other animals, so it’s neat to see more vegetative life forms for a change. The Mazon are heavily woven into the fabric of Earth’s history, with inscriptions on hidden pyramids and other architecture. These plot points resemble the type of conspiracies Ancient Aliens is known for, and they’re a lot of fun to read about (since no one is actually treating them seriously). Art-wise, this volume is a very mixed bag. The characters’ facial expressions are very emotive, some of the outer space shots are lovely, and the inking throughout does a lot to enhance the story’s tone and sense of drama. With that said, a lot of the line-work is very simplistic, and while it’s often charming it doesn’t always work well. The discrepancy in the amount of detail put into spaceships versus some of the characters is jarring, and some panels look downright scribbled. Daiba and Harlock also have very similar faces and hairstyles, so it’s sometimes difficult to determine which character is speaking. All in all, Captain Harlock: The Classic Collection Vol. 1 is an enjoyable read. The main duo is classically cool, the prose is purple in the best way, and the inking throughout is fantastic. The series’s aliens are also neat due to their deviation from the usual tropes associated with extraterrestrials in fiction. With that said, a lot of the characters and humor fall flat. The simplistic artwork is also hit-or-miss in terms of being charming or just looking unfinished. Nonetheless, it’s fun to look back on fantasy manga from many decades past. I would recommend this series to anyone interested in classic sci-fi fun. It's easy to see why this series is a classic thanks to its charming prose, excellent inking, and unique alien species. Unfortunately, the cons are major enough to make this just a decent volume.